Once most people graduate from grade school, it isn’t often that they are made to complete word problems and puzzles. While some people may encounter a few riddles to keep them on their toes during job interviews, the majority of people won’t see a problem like this unless they go searching for it…or in this case, when it scrolls across their news feed! When friends began getting challenged by other friends with this visual puzzle, they were split between two very different answers…but which one is correct? A lof ot people thought that the answer must be a negative number. 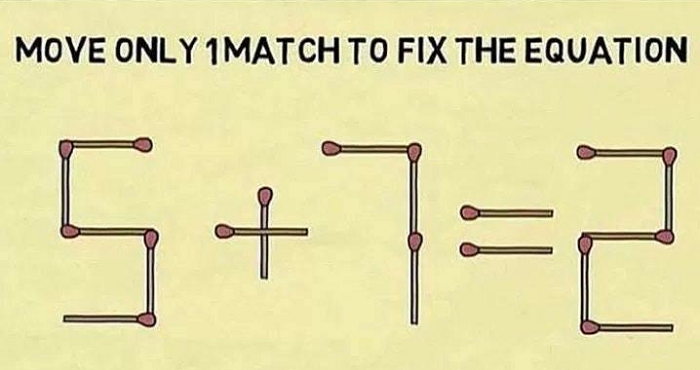 After all, when they moved the vertical match away from the +, it created a true equation. Which equation did you create first? Did you think that one of these answers was more correct than the other? Maybe the person who invented this equation just didn’t think it all the way through! When people began to argue over which answer was better, the problem went viral…which meant that more people saw it and argued again! Which answer did you choose?